This is the cake I alluded to (i.e. described in its entirety) when I was telling you about the Pink Vanilla Macarons which sit on top. Thankfully, even though describing my cake plans is a sure-fire way for them to go wrong, I can happily report that this cake was a success. I made this cake to sort-of celebrate my 23rd birthday, but it turned out that I was having too much fun celebrating in other ways to bake. Last weekend I did an overtime shift at work, came home, got spruced up and went out for a meal with friends before carrying on into the night with one or two (or three... or five...) beverages. If anyone happens to be passing through the town of March in Cambridgeshire, I highly recommend The Spice Bank for their fantastic food and unexpected free birthday wine, cake and card. Sunday was my birthday, but lucky for me I don't get hangovers so I pretty much sprang out of bed, waited for 11am to happen then went to the shops with a friend. Much shopping ensued. In summary I had a very good day. Anyway, let's talk about this cake. We have three layers of sponge cake, sandwiched with a pink Swiss meringue buttercream, topped with more pink Swiss meringue buttercream, Pink Vanilla Macarons and some sprinkles. Granted some of the macarons are a bit cracked, but that's part of the trial of making them. They are a bit big; the cake could do with a few more layers to counteract their size. However, I am very pleased with the cake as a whole, and you know what? It tastes great. This cake would be perfect for a big occasion (such as a birthday). It can be made in stages for convenience: the macarons last about 2 weeks kept in the fridge, and you can freeze the sponges for about a fortnight too. Preheat the oven to 200C/180C fan and line three cake tins with parchment paper. Fold in the milk to give a soft dropping consistency. Whisk in the pink gel food colouring. Sandwich the cooled cakes together with the buttercream and decorate as desired. 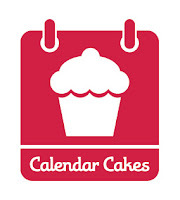 This month's Calendar Cakes challenge, hosted by Dollybakes is about things that make you happy. This cake is all about my favourite colour and was made to celebrate my birthday, so I believe it fits the bill. 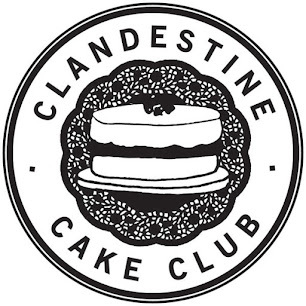 The challenge is alternately hosted by Dollybakes and Laura Loves Cakes. Happy Birthday for Sunday. Sounded as though you had a good time. And your cake looks fabulous. I think I tried making meringue buttercream once and it was a total failure; I've never dared try again. I think it really depends on the quality of the butter. I always find it goes very soupy until all the butter is added - sometimes it feels like I am just spreading glorified butter on my cake, but other times it goes silky and soft and is easier to spread. Do try it again as when it works it is great. It's a lot less sweet than your average buttercream though so can be an acquired taste.